We are committed to increasing the biodiversity of livestock and raise only rare breeds. We are members of the American Livestock Breeds Conservancy (http://albc-usa.org/) and are also interested in raising animals similar to those that would have been raised in this area during colonial times. Goats: We raise two feral breeds of goat: Arapawa Island and San Clemente Island Goats. Both are listed as critically endangered by the ALBC and they number in the low- to mid-hundreds worldwide. They share a similar history and were left on islands by European explorers sometime around the 17th century. Arapawa Island Goats are believed to be decended from an old English breed, now extinct, that would have been similiar to the breed brought over to this region on the Mayflower and by other early settlers. We are excited to begin breeding our goats and contributing to growing their numbers and improving the stock. Hogs: We've raised Tamworths, listed as threatened by the ALBC, and Berkshire/Large Black crosses. Large Blacks are listed as critical. 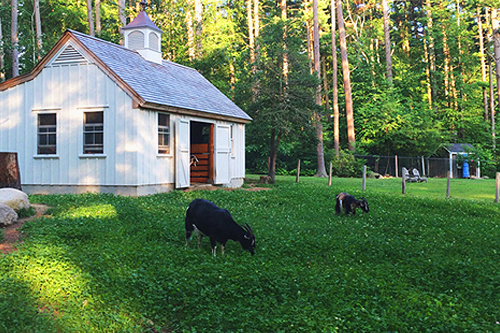 This past year we raised five Ossabaw Island hogs, a feral breed with a simliar story as our goats. They are critically endangered and number in the hundreds. Chickens: We have a small flock of Rhode Island Reds (Non-Industrial), Partridge Plymouth Rocks, and Buckeyes. Buckeyes remain threatened though were upgraded last year from critical and the other two breeds are happily recovering. We're hoping to add to our flock and help to grow the numbers of rare breeds of poultry in the future.